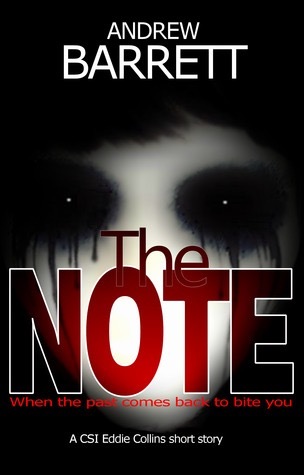 I’m so pleased to be a stop on the blog tour for The Note today! This is the second book I’ve read by Andrew Barrett, I read Ledston Luck a few months ago and was really impressed. That was the fourth in a series featuring CSI Eddie Collins and I loved his character and the fact that the story was told from a fresh perspective. Andrew Barrett is a CAI himself so the authenticity is outstanding and you know you’re getting a true look at the life of a CSI. The Note is a short story featuring Eddie and it was fun to check in on him again, albeit briefly. Barrett sure knows how to set a creepy stage, it opens late one evening when Eddie is processing a crime scene and gets that uneasy feeling of being watched, unawares. Then, he finds a note that says he’ll be dead tonight. The atmosphere was really fantastic, late at night, alone in an office then at home, I was paranoid for Eddie’s safety just as much as he was! The chilling cover certainly matched what was inside and had the hairs on the back of my neck standing on end. As it’s such a short story I don’t want to say anything more about what happens, but Barrett manages to include a few shocking plot twists in a short amount of time. Even though Eddie is scared for most of the story his sarcasm and wit is still there, maybe even more so than usual. Defensive mechanism perhaps? I don’t know, but it always works for me! This is a perfect introduction to a great character, so if you haven’t read any of the books in this series, why not start here? Authenticity and creepy? I’m in! Right?! It’s a super fast read too which is a bonus! Ummmm creepy, creepy cover! I love it!! OMG that cover!! So Scary! What a super creepy cover! I’m sold lol!